As a third-generation Minnesotan, I have a very, very special place in my heart for the open prairies, reasonable prices, and socks-with-sandals pairings of the Midwest. People on the coasts poke fun at us and consider us flyover country and that’s fine. I’m happy to keepall these lakes and space and kindness to myself. My mom’s side of the family came straight from Sweden and Norway to South Dakota and hunkered down among those rolling fields, so I’ve been spending summers in Watertown and Rapid City for my whole life. 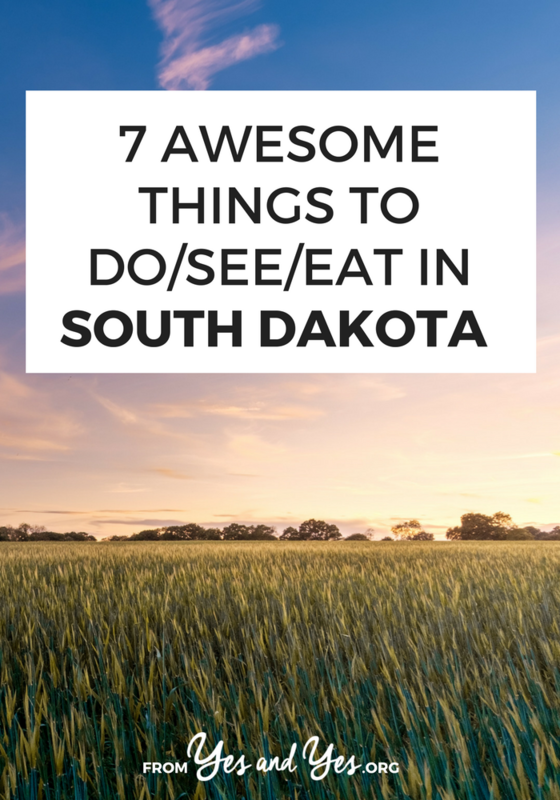 I know you might not believe me, but I swear there are heaps of fun things to do in South Dakota! I spent July 3-6 driving across those plains and taking photos of giant prairie dogs and here are some of the awesome things I encountered. Plan a road trip here! It’s cheap and fun! I’ve been vegetarian since I was 12, so I can’t really personally vouch for these but I’ve heard great things. These burgers are widely available in South Dakota restaurants and don’t worry! Both of the Dakotas have large populations of Native Americans and some of their amazing food has become a delicious staple for anyone passing through. An ‘Indian taco’ contains the same ingredients as any other taco (well, any other Midwestern taco – shredded iceberg lettuce, tomatoes, shredded mozzarella and cheddar cheese) but instead of a tortilla, it’s on fry bread. They are super good and super unhealthy. Go to the Laura Ingalls Wilder house! Did you devour these books as a kid? I did. I spent hours making forts under the trees and trying to eat acorns and attempting ‘snow cream’ after reading about Laura and her adventures. Because the Ingalls family moved around so much, there are several tourists destinations devoted to them around Minnesota and South Dakota, but DeSmet is where Laura got married and where her parents are buried. You can tour a school house, see a dugout house, even see the graves of Ma and Pa. It’s grade-A literary dork out. As established, I love a good factory tour. So I’m obviously intrigued by people crafting jewelry by hand. This particular jewelry company is family-owned and uses locally sourced Black Hills gold for much of their jewelry. Weird fact: over time, gold dust collects in the carpets of the factory and when it’s replaced, the owners actually put the carpet through a special process to extract the gold dust. The gold dust from the old carpets is worth so much, it pays for the new carpet. Weird, right? More awesomeness for your inner fourth grader! At The Washington Pavillion you can see a replica of ‘Stan’ the t-rex found in South Dakota, excavate dinosaur bone replicas, touch a real dinosaur bone, and view a fossilized dinosaur egg. At the Museum of Geology you can see more than 500,000 specimens of fossils, rocks and minerals, providing a vivid impression of Dakota life in ancient times. Exhibits focus on paleontology – including mounted skeletons of dinosaurs, mammals, White River Badlands fossils, marine reptiles and fish and meteorites! They even have ‘Family Paleontology Camp! Cuuuuuute! Well, dur, right? The badlands are truly awe-inspiring and sort of creepy when you imagine those covered wagons spotting them for the first time. Of course, you can pay $15 to drive your air-conditioned car through the badlands and take pictures with your phone through the window, but we’re all a bit more intrepid than that, aren’t we? The backroads on South Dakota are filled with picturesquely crumbling barns and farmhouses and strange, oversized statues of stuff. They boast the world’s largest pheasant, a giant concrete prairie dog, an an entire tourist attraction devoted to dinosaur statues. See? Aren’t you all excited to drive across the plains, spotting bison, and eating an Indian taco? Do you live in the Dakotas? What else did I miss? Any other South Dakota travel tips? P.S. 10 things to do in Florida if you (like me) don’t like amusement parks. P.P.S Did you know you can rent this amazing ranch cabin in Hermosa, South Dakota for $75 a night?! Also: here’s $40 off if you’ve never used Airbnb before! I really NEED to go to see some Laura Ingalls dugouts and dress up in bonnets and travel around in a wagon. And I'm pretty sure my other half would love the Museum of Geology. I can see a trip to South Dakota on the horizon! Oh my gosh! My husband has SD fairly high on his U.S.A. travel list. You've just convinced me that I may need to reconsider the sideways glances and "hmmm…we'll see." I give him every time he mentions it! This will be my second trip to South Dakota and our Mom’s third! Mom is 81 and my sister and I take her on a trip every year. Not sure how many more we can do, so asked her where she wanted to go, she said South Dakota! So here we come! Visiting the Black Hills the week AFTER the Sturgis motorcycle rally, especially Sunday-Wednesday, is wonderful. Fewer people…. AHEM. I have lived in both the East River area and West River area. I now live near Sturgis! -Visit all the different caves- Wonderland, Crystal Caverns, Wind Cave- holy awesome! -Watch storms roll across the plains or the Hills. It's epic. -Eat chislic. Totally regional weirdo food one has to try. Oh, yeah! Custer State Park and Wind Cave both great places. I love this. Being from Kansas, I'm constantly on the defensive about the Midwest. People should give it a chance before they mock it! That part of the country is full of kindness, good food, gorgeous open landscapes, and interesting culture. I have a totally unexplainable obsession with the Midwest. Going to Spearfish Canyon, Deadwood, Hill City, and Custer State Park are some of the best places to go in the Black Hills area. Sioux Falls and Pierre are also different with a lot to see and do. @Sara Rose you have picked many great places also. can't wait to go back for a visit. Thanks! I dig living here! I went to South Dakota for about a week last summer and had the best time. Before I left everyone gave me the funniest look when I told them where I was going. It turned out to be an amazing trip and I can't wait to go back and see more! How can you leave out the Black Hills?!? So much to do and see there! I just keep going back and going back. I never want to leave! I'm so happy you saw the Laura Ingalls Wilder sites! That's been on my list for years! Anyway, I dream of going to DeSmet. I actually live about an hour away from Mansfield, Missouri, and have been to her house there several times. It's terrific – the house is amazing (even more amazing when you think that Almanzo built it himself), you get to see some awesome stuff like the original manuscripts for a couple books, the clock that Almanzo traded a load of hay for (it still works!) and of course, Pa's fiddle. Wilder Days are coming up so I might head out for that again (actually, it'd make a great blog post!). I always figured when I do get to take my trip to DeSmet, there wasn't much more I'd do other than go see Mt. Rushmore. I mean, South Dakota isn't exactly a tourist destination. I think I might make a hiking/camping trip in the Badlands as part of it though – sounds like fun! Thanks for the idea! I lived in South Dakota for a few years in elementary school, we could have been friends! Great list and the comments have included some of what I would add. Also, it sounds like it's gotten more and more touristy since we left, but Wall Drug is a must. I still have a bumper sticker from there somewhere and we always stopped there when we were going that way. Badlands and Black Hills are amazing. A Black Hills gold necklace was the first thing I ever bought with my own money and I saved up forever and then spent even longer picking out exactly the right one. Even though I rarely wear gold anymore, I still have that necklace. Also, Crazy Horse. It's an odd place and might not be completed in my lifetime, but worth seeing in real life. Rumor has it there aren't really any photos or paintings of Crazy Horse and that he didn't want his likeness captured anyway since they believed it was stealing the spirit or something along those lines. So, someone decided to put his face on a mountain. They only had the face and the top of the arm when we were there…when I was in 5th grade. From photos I've seen, they haven't made much progress. I'll be 30 in a few weeks. But, if they still do it, once a year, they let people walk out on the arm as a fundraiser. My parents did it and even though it was rainy and muddy and Mom slipped and fell, they loved it. Take a drive through Custer state Park is amazing! I have lived in SD my whole life and still do. It is amazing and I recommend learning to read a map because all the back roads are the best expecially when you are lost and in the middle of road construction on a back road. It make you stop and actually look and think. It is so beautiful. I don’t remember which road it is but it’s the road going straight south out of Pierre. You drive right along the Missouri River and some of the parts that you see look like the places in that new Leonardo Decaprio movie that takes place in South Dakota it’s call the Reverent. It’s amazing how people managed to settle the land and everything. My great grandparents settled in the Southeastern part of SD and I love the family history here. Tons of history through put the state. My great grandfather is mentioned in a book about the area. It’s called Giants in the Earth. Ole Olson was his name. Love it here! That’s where my family is from – Watertown, SD. My great-grandpa is Gus Larson! I was transferred to Rapid City last year and have a beautiful country home in the heart of the Black Hills-l love it here and there is so much to do! Visit Hill City; go for a 1880 train ride after having an amazing lunch at the Alpine Inn in Hill City. The train will take you to Keystone. Go see the gun fight, which has a very funny and cute show that all ages will enjoy. Walk around Keystone, get some fresh made candy and relax. Then Return to Hill City on the train , go to the winery’s, including Prairie Berry for free wine tastings, or walk around all the neat stores/museums in historic Hill City and then return to the Alpine Inn for an amazing steak and salad for only $14. And then try one of their incredible deserts which are so good. The next day, take the kids to Bear Country USA, the Mammoth Site in Hot Springs, and a lunch in Custer before going thru Custer State Park to see the buffalo which is really fun. And close by, the sunsets, stars, mountain views and wildlife on the Needles Highway are incredible! All so close to Hill City, truly the Heart of the Hills!